Adopted the lastest coectrusion techinque, LIMELITE PC Transparent Corrugated Sheet is some kind of corrugated sheet mainly using German Bayer Makrolon polycarbonate resin engineering plastic and adding anti-ultraviolet material(UV) and other raw chemical material. A set of excellent physical features makes it as one kind of outstanding roofing tile. As one choose for the anti-rust roofing tile in the industrial building and side wall, LIMELITE PC Corrugated Sheet is popular by professionals for its high impact strengh, wide temperture adopation, high light transmission, and unlimited appearance can change itself to be any profile, which also makes it as the prefect lighting material for flat roofing. Enjoying many color chooses, the sheet is provided 10 years quality warrant. The light transmission of the sheet is quiet good, with the rate up to 90%. The impact strength of LIMELITE PC Transparent Corrugated Sheet is 250-300 times of ordinary glass, of 30 times of acrylic plate to the same thickness. Simulated hail impact test: Using the simulated hail impact test machine to simulate hail impact. A diameter of 20mm (weight 4.8g) of nylon balls in the speed of 21m / s launched on the model to observe the extent of damage. We found that glass and acrylic forces have been ruptured or broken, while the LIMELITE PC Transparent Corrugated Sheets are unbroken. 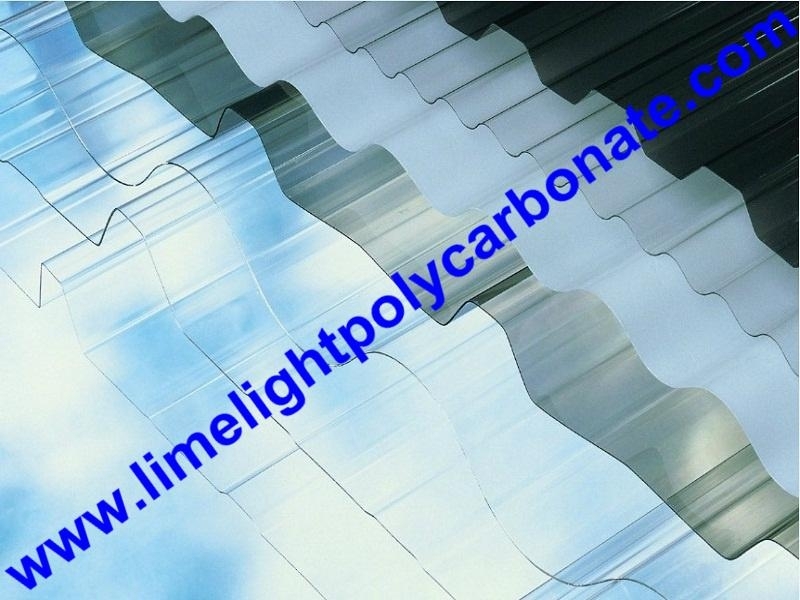 In the real life, the speed of hail to the diameter 20mm, can reach up to 21m / s.
LIMELITE PC Transparent Corrugated Sheet’ is co-extruded one layer of 50um UV on one side preventing ultraviolet rays from passing through, which has an effect of good weather resistance.The side of anti-UV treatment layer should be faced to the sun. Only half weight of ordinary glass, LIMELITE PC Transparent Corrugated Sheet is saving the costs in transport, unloading, installation, and supporing framework. With the self-ignition up to 580 ° C, LIMELITE PC Transparent Corrugated Sheet can be self-extinguishing after being away from the fire. Toxic gases will not produced during burning. And the sheet will not fuel the fire from spreading, which is reach National Standard GB8624-1997 and flame retardant Grade B1. LIMELITE PC Transparent Corrugaed Sheet occurs no cold crisp in the -40 ° C and no softening in the 120 ° C. Even in the harsh environment, its properties, like Mechanics, mechanical, etc. have no significant change. At present, more than 10 profiles of LIMELITE PC Transparent Corrugated Sheet can be choosed which can be convinent to be used together with Color Steel Tile of different profile. 10 years quality warrant is provided for LIMELITE PC Transparent Corrugated Sheet. Length: based on customers' requirements (on the conditions that it is suitable for transportation). Lighting for factories, warehouses and markets. property which prev-ents the sheets from discoloration and inferior quality. 2.Never contact the organic solution or glue and paint consisting of the organic solution.